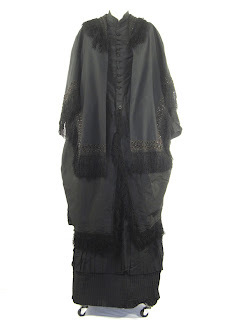 This auction is for a three piece antique Victorian era ensemble which I am assuming was worn during mourning? It has flaws and appears to have been in the process of re-fashioning. Sold as-found, as-is, please see all photos. 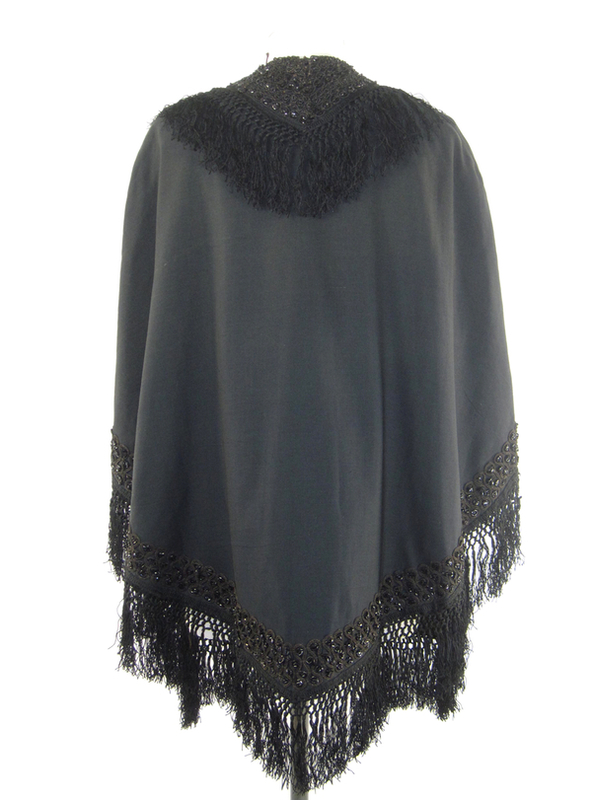 SHAWL: Made from what feels like a very fine, woven wool. Lined with a gold, woven, chintz-like cotton. Embellished with looped, finely braided, applique; intricate black beading and woven band fringe. It measures: 34" flat across the front between widest points and 33" total length. Condition: Smattering of holes that appear to be moth damage. Some loose trim. A few light circle marks. Please see all photos. 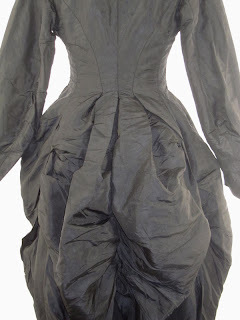 DRESS: Made of what I believe is silk satin. Black and lined with gold, chintz-like woven cotton. Stunning era-characteristic design with extensive seaming and gathered bustle back. 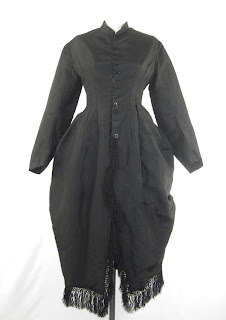 Small black and fabric braid button front. 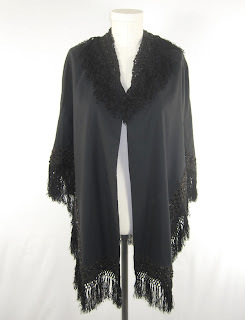 Trimmed with fabric fringe. It measures: 17" measured across the chest between the underarm seams; 13 1/2" measured across the front at narrow mid-section; full hips; 23 1/2" sleeve length; 14 1/2" measured across the upper back between the shoulder seams and 50" length measured down the front from top of collar to longest part of hem. Condition: Very good. It appears as though it were in the middle of being altered. Parts of the big bustle back skirt are un-gathered and parts of the hem have a raw edge. 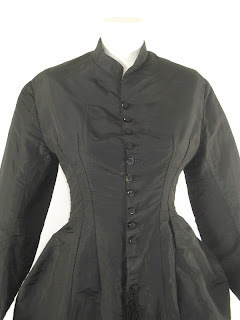 Missing a couple of buttons and it looks like there was some sort of clasp at the throat. Minor abrasion marks here and there, the photos show this piece well. 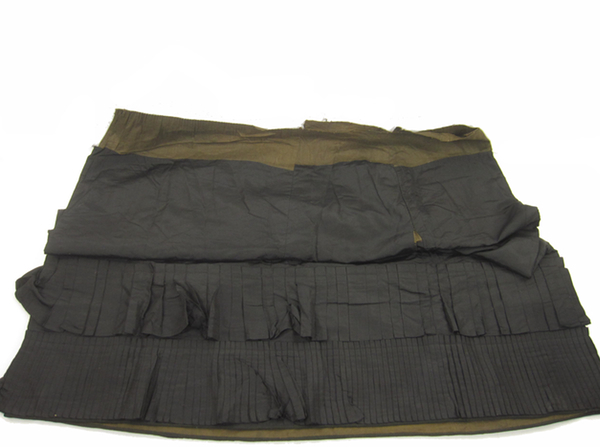 SKIRT: The skirt is EXTREMELY wide and has a raw edge all around the top. It looks like a waist band was in the process of being added. Made of matching black silk satin with a layered, finely pleated hem. Lined with the same gold, woven, chintz-like cotton. 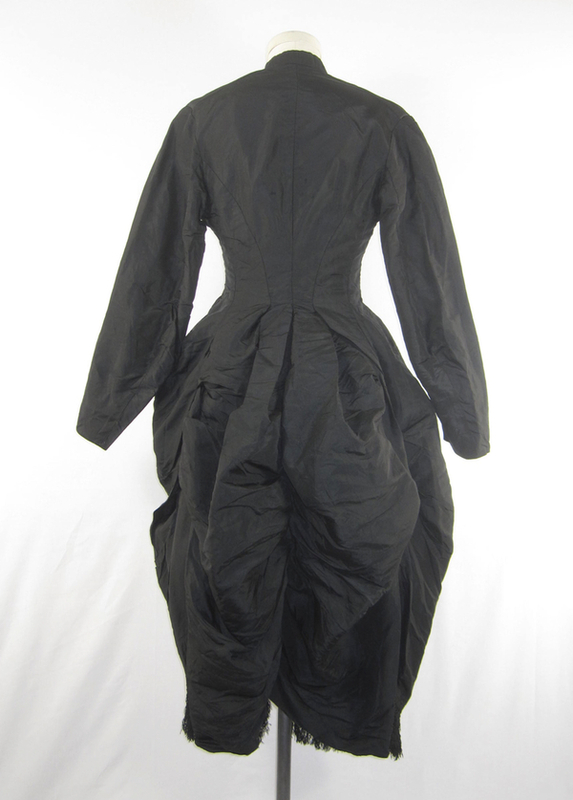 It measures: 66" around unfinished waist; 42 1/2" length. Condition: A few holes, needs to be re-assembled. Also included are some metal fringe trims that were in with these pieces when I found them, see photo. Label: None. 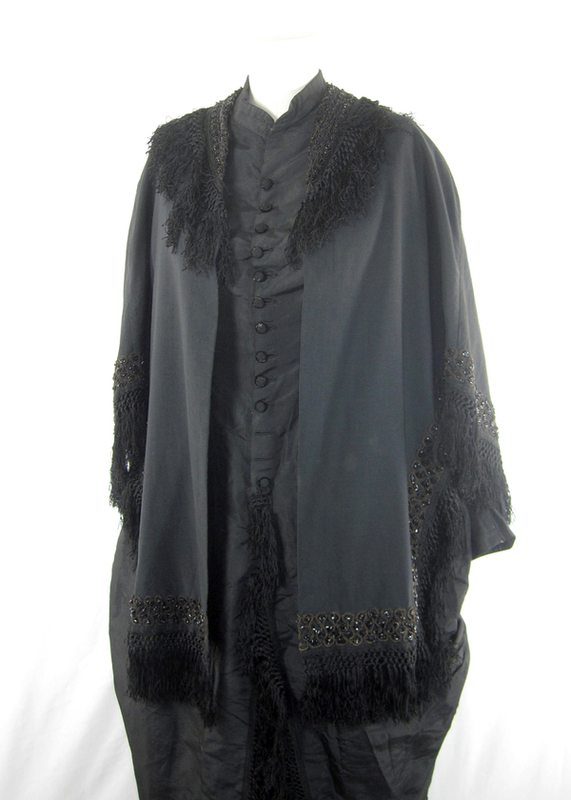 I agree with the seller that this is probably a mourning gown.